With word yesterday that social network in a box provider Ning will stop offering free plans, many smaller, yet still valuable social networks will be forced to find new digs in the coming weeks. We’ll be affected here in higher ed as well. Many institutions have been running admitted student networks or alumni networks in Ning and will need to decide not only if this is something they are going to continue doing it but if they are going to pay the new Ning’s rates going forward. If you don’t have the budget for Ning or another provider’s services, why not build your own social network? It may be easier than you think. BuddyPress is dead simple to install and get going, and it’s very supported in the WP community, so fear not that the product will up and go away. If anything, I’d expect to see BuddyPress and it’s features integrated more and more in the main WordPress codebase. So, how easy is it to install. No lie – I started with an empty directory, installed WordPress (via command line, super fast and easy), logged in, and from the plugins menu, automatically installed BuddyPress. Done. Total time from nothing to social network: 8 minutes. It took a few minutes longer because I made a fancy logo for the install. Managing groups and users inside BuddyPress is super easy, and if you’ve spent any time in the WP interface, it will all be second nature to you. Let’s take a second and look at the pros and cons of using BuddyPress as your social networking platform. You control the horizontal and vertical. You decide colors, layout, templates, features and so on. In the one-size fits all model, you’re stuck with whatever few templates your provider offers. You may already have the server power to manage this internally. You can integrate this, via code and plugins, with your content delivery network or other cloud storage you’re using. I’ve been meaning to blog about this more, but file and media storage for your CMS or social network is something that you shouldn’t ignore. You want users to generate and share content, but you want to store and serve that content quickly and easily, all the while keeping an eye on security. Finally, by running your own network, you are not beholden to any company that can stop offering its service with little or no warning. If you run the show, you decide what goes on and when its time to upgrade or shut it down. While it’s a big pro, the fact that you and/or your IT group is responsible for keeping WP and BP up and running is something to keep in mind as you plan your social network. In running WordPress and Allegheny for almost a year, we had zero issues and no downtime. It’s pretty stable, but something to keep in mind. 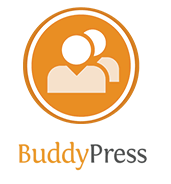 By committing to BuddyPress, you’re betting on the fact that the community will continue to develop new features and offer a good support forum where you can share and learn from other BP users and developers. Companies like Ning are interesting because they do the heavy lifting, software development and support. By striking out on your own, you’ll be responsible for everything from managing spam, user accounts, content and so on. Something to be aware of in an era where we’re all being asked to do more with less, both in terms of people and budgets. As a matter of fact, here’s the network I built. 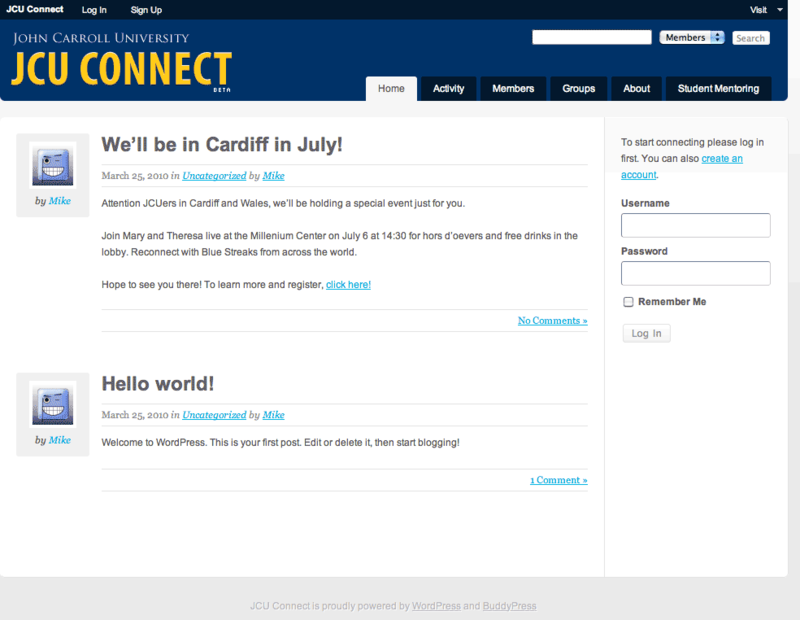 Here at JCU, we’re transitioning our alumni network from one provider and haven’t yet decided what we’ll use in the future, and while I’ve read a ton about BuddyPress, I’d never actually used it. Now, I’m a big fan. Feel free to create an account in there and try out the features from the user perspective. I’ll leave it open for a few days.